"Sampath Speaking" - the thoughts of an Insurer from Thiruvallikkeni: Tanker TORM vessel visits Chennai Port, seen at Marina ! 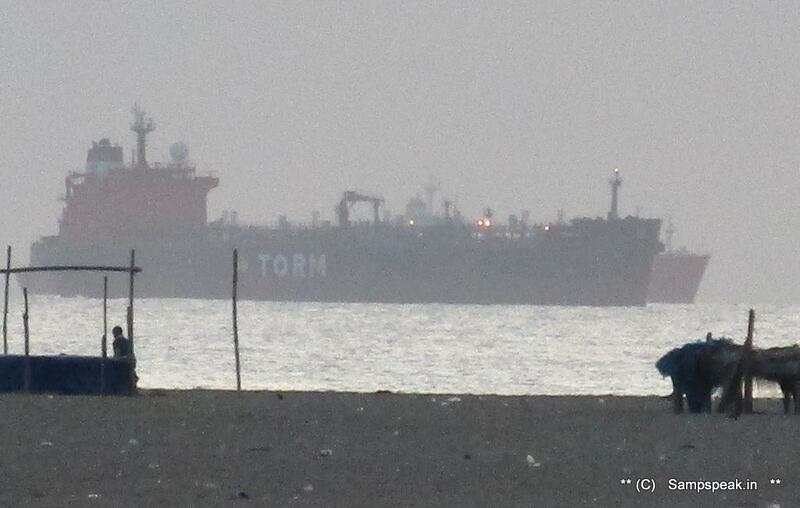 Tanker TORM vessel visits Chennai Port, seen at Marina ! At some point of time, you sure would have admired the pristine beauty of Marina beach – the sandy shore than runs from Fort St George to Besant Nagar. Triplicane boasts of Marina beach, one of the great coastlines where you can enjoy the tranquility of sea and see with wonder the ships that sail on the Bay of Bengal. From the tiny village of Chennapatnam in 1639 to the present day metropolis Madras aka Chennai has grown immensely. In the 18th century, British East India Company converted the open roadstead to a port though the transportation from ships was by way of lighters. 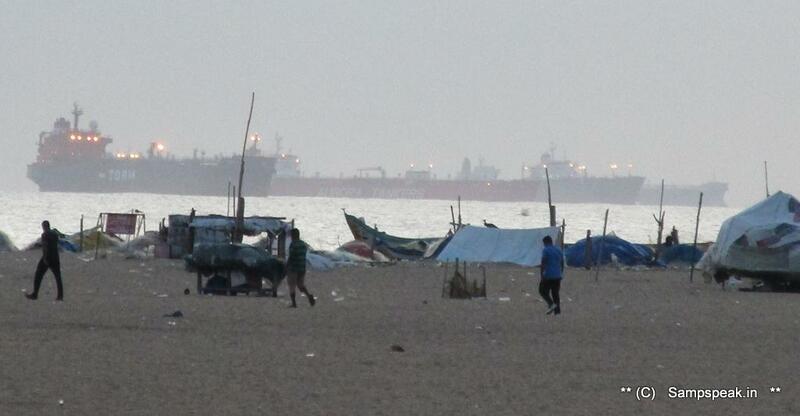 ChennaiPort, an artificial port of over 125 years of existence, is the second largest port of India. From a predominant travel port, it is a container port today enabling growth of trade exports of industrial houses of South India. The beach famed for its beauty, ambience and rich eco system, stands a lot polluted though gets beautified by successive Governments. Crowds throng the beach on holidays and in summer to enjoy the cool sea breeze. On the road side, many stone statues, some of them installed during the Tamil World Conference adorn the area. Nearer the shores of Bay of Bengal – in the mornings or in the evenings, one can hear the sea, the sound of waves, see and enjoy – the waves jumping and touching the shore and then submitting themselves to the shore but trying to come-back to conquer again ! would be very interesting sight. For visitors with no knowledge on naval adventures too, the difference in type and size of ships would be discernible. As one walks, one could see a ship in a distant angle, sometimes, with the walk – still the angle may not change, and vessel might appear more distant – ‘angles are also deceptive’. Over the past few days, have been watching this ship, which looks much bigger than the usual ones anchored in the outer port area. .. .. with the zoom, the name in the ship could be read as “TORM”. .. … it is not ‘storm’ ! A/S Dampskibsselskabet TORM or TORM, based in Copenhagen, Denmark, is a shipping company that owns and operates product tankers and bulk carriers. From its website, read that TORM was founded in 1889 and has sailed the seas for more than 125 years. With activities worldwide, TORM is listed on Nasdaq Copenhagen. TORM’s offices are located in Copenhagen, Houston, London, Manila, Mumbai and Singapore. TORM is a pure play product tanker company and one of the world’s leading carriers of refined oil products such as gasoline, jet fuel, naphtha and diesel oil. With vessels varying in size from 35,000-110,000 dwt., TORM operates a large and modern fleet of product tankers. Not sure whether this vessel is .. Vesselfinder.com lists ‘TORM FOX’ (IMO: 9302114) a chemical/oil products tanker built in 2005, sailing under the flag of Denmark is in Chennai port. TORM FOX has 183m length overall and beam of 27m. Her gross tonnage is 23246 tons. Interesting ! ~ and here is something on its carriage pattern in a tanker.